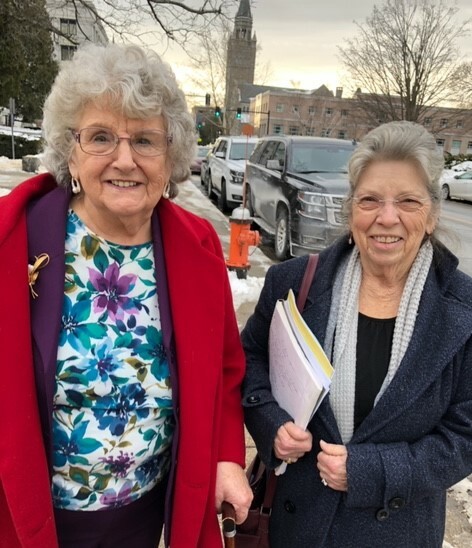 Harriet Cady and Gloria Riel, both of Deerfield, attended hearings at the Legislative Office Building in Concord on proposed right-to-know bills on Wednesday. 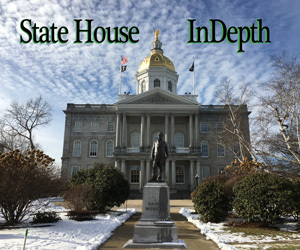 CONCORD – It was right-to-know day at the Legislative Office Building on Wednesday as a collection of bills crafted to improve the public’s right to access government records were heard before the House Judiciary Committee. The intent of the bills is to shine a light on what is going on at town halls, police stations, and government agencies across New Hampshire, said David Saad, president of Right To Know New Hampshire (RTK-NH). His grassroots organization made up of citizens assisted about 70 individuals in getting answers from government agencies. He estimates two-thirds of the cases that came to RTK-NH last year involved delays or denial of record requests. As introduced, House Bill 286 would require no fee for the inspection of public records. House Bill 396 would require a public body or state agency to provide written reasons for any delay or denial of records under the right-to-know law. The goal of New Hampshire’s law, RSA 91-A, is to protect the public’s access to those records, with some exceptions related largely to confidentiality, privacy and security. The focus of House Bill 286-Local is basic access to records by not placing financial impediments to obtaining records, said state Rep. Mike Sylvia, R-Belmont, the bill’s sponsor. This would allow the public to view the documents for free and not be charged for government preparation or redaction. Copy fees may still apply, but there would be no cost for the preparation or redaction under the bill. People could use their cell phone and take a picture of the document without charge. But for those in jail or prison, “you can’t get that information by going to town hall,” said Lynmarie C. Cusack, director of professional standards for the Department of Corrections. “We would like to be able to charge that individual the 25 cents or whatever it is for the copy,” Cusack said. “Many like to manipulate the system,” she said of inmates. Outside the hearing, Cusack said other states allow for such exemptions. State Rep. Charlotte DiLorenzo, D-Newmarket, said: “If records are immediately available for inspection, they must be released.” And if not, she said a written explanation must be made within five business days. But Margaret Byrnes, executive director of the New Hampshire Municipal Association, said sometimes it is impractical for an official to “immediately” respond. She said her organization has issues with portions of the bill and much of its intent is already covered under the current law. State Sen. Bob Giuda, R-Warren, said the purpose of the legislation is to clarify “a systemic problem” where public access is being thwarted. When you start to add costs, he said, it favors the agency and creates impediments to the public’s right to know. “We are trying to open the window and level the field. If you are going to deny the record, we want to know why,” Giuda said. Records could be denied because the request is too broad-reaching, involves personnel issues and other reasons that could be protected by law, Giuda said. They need to be articulated, he said. Saad, president of RTK-NH, spoke about legislation that would create a state ombudsman to hear right-to-know complaints outside of the courts. In theory, that would save money and time for the court, he said. A work session on one of the bills, House Bill 103-FN-A that included hiring an ombudsman, was held Wednesday and voted inexpedient to legislate. It was sponsored by Rep. Lynne Ober, R-Hudson, and opposed by RTK-NH because it included a $300 filing fee to be heard by an ombudsmen. House Bill 729 includes essentially the same language as one killed last year, Senate Bill 555, and is supported by the RTK-NH, and would not only call for an ombudsman, but a right-to-know appeals commission as well. No hearing has yet been scheduled on House Bill 729, but it will also be heard by the House Judiciary Committee. He noted that in 2017, his organization handled 59 right-to-know issues and this past year, the number was 68. Passing these bills would be steps in the right direction, he said.